The deluxe aviator accessory kit is perfect for depicting Amelia Earhart for school projects or as an aviator costume for Halloween that is quick and easy to change into. Many of our directors use this kit for Snoopy in "You're a Good Man Charlie Brown" or Graylag in "Honk!". 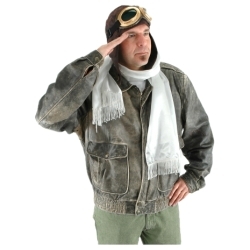 This kit includes three of our top selling aviation themed costume accessories in one great package that saves you over 25% than when purchased separately. The deluxe aviator costume accessory kit includes an aged faux suede brown aviator helmet, matching gold and green goggles, and a white fringed aviator scarf.